This crib size quilt is made from super soft flannel. 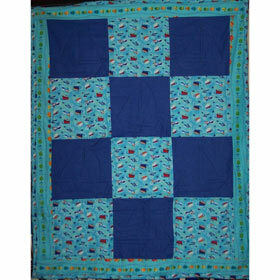 Each solid blue square has a unique quilted sailboat with two sails and some have a flag flying as well. There are smiling sea turtles swimming along the side borders and green, orange and blue jelly fish floating on the top and bottom borders.